SEASONAL BOARD EDUCATION FORUMS, BOARD CERTIFICATIONS, DEVELOPMENT PROGRAMS & MORE! Southern States Management Group, (SSMG) launched their education initiative in June 2018 and have been pursuing every opportunity to collaborate with local professionals in an effort to educate community association leaders. The underlying goal of this initiative is to provide those leaders with thoughtful insight and practical knowledge to address the challenges that they face throughout the year. We recognize that these community leaders are volunteering their time and efforts and it is in keeping with this spirit that we endeavor to make sure that they are well equipped to face the challenges that may arise. – Ways to secure your communities and maintain business continuity in the face of an impending disaster. – How to facilitate and begin an insurance claim to be ahead before you get behind. – How to better understand how insurance claims are handled from a legal perspective. – Financial & Strategic Planning. – Effectively Run & Administer Board Meetings – Association Election DOs & DON’Ts, Tips on Robert’s Rules of Order. – Controlling Costs & Bundling Services. – Importance of Hiring Licensed Contractors. – Capital & Reserve Planning for Community Pools & Other Outdoor Amenities. – Directors & Officers Insurance Overview. – Restoration Company Relationship, Financing Options That Make Sense, Best & Worst Case Disaster Solutions. Additionally, our education events encourage an opportunity for community leaders to share ideas, stories and challenges while developing relationships with other association leaders within the community. These programs have grown in popularity and fill up quick! You’re invited to our “Seasonal Education Forum” happening on Wednesday, April 24, 2019 from 5:30 p.m. – 7:30 p.m. at Oceanside Country Club located at 75 North Halifax Drive in Ormond Beach. – Collection Strategies for Your Community – how can you aspire to maintain the beautification of your community if you’re constantly behind in your collections? Learn strategies that Southern States Management Group has seen through the past three decades. – Pool Safety & Leak Detection – beautiful weather = more bodies in and around the pool area. Is your community up to code and prepared for the increased volume the summer months provide. This is also a great time to learn about the process of leak detection and what potential liability claims that can occur. – Commonly Overlooked Insurance Exclusions – learn about common insurance exclusions and what you can or cannot do to help avoid them. – Dog bites, “No Pet” buildings, service dogs and more. We will be discussing animal-related liabilities. – Hurricane Essentials – Hear from First Response Disaster Team on ways your community can be best prepared before the hurricane season begins. There is limited seating so please RSVP by filling out the fields BELOW. For more information email Diane at SouthernStatesManagementGroup@gmail.com or 386-538-1083. 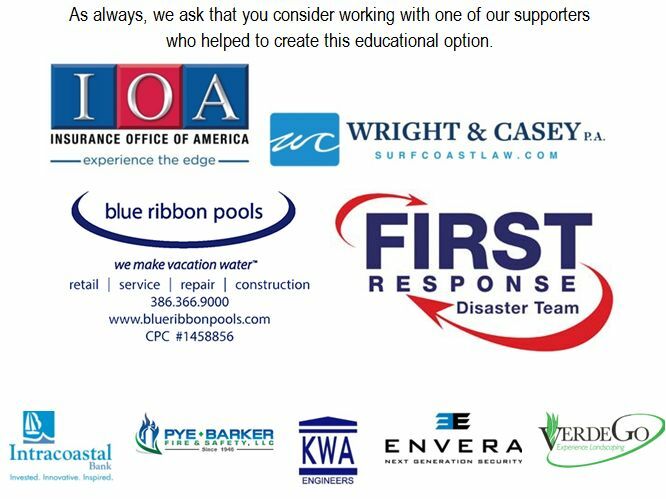 Thank you to our education sponsors for this Forum! Please let us know a hot topic question that we can pass along to our professional panel consisting of community management, enforcement, restoration, common area, insurance and the overall building or community envelope. 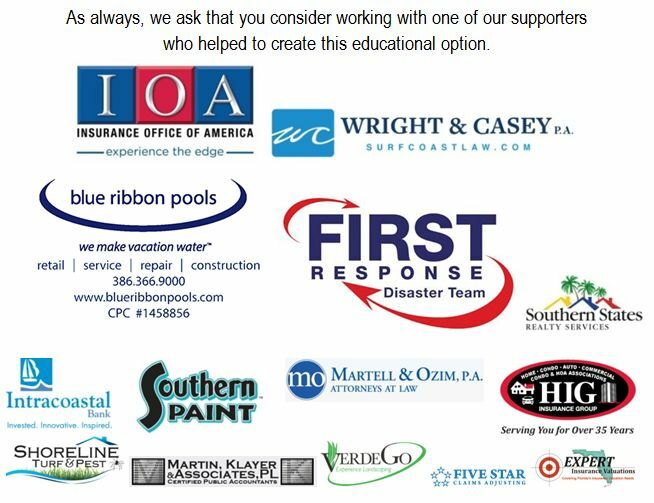 Thank you to our 2019-2020 Education Supporters!